Talking about (urban) alottment gardens the other day, one of the advantages of living in downtown Frankfurt am Main is that there’s this special park in the neighbourhood which used to be a nursery a looooong time ago. After it had closed many years ago, the biggest part of the garden was turned into a public park, the other part into a *wilderness* with lots of small paths and a diverse flora & fauna. In other words: there’s this public shamba next door that delivers free food for those who just don’t see a green wilderness but instead an ideal source of natural ingredients for the afternoon tea healthy drinks! Now, what do I do with the other half? A blackberry-pancake? Blackberry sorbet? 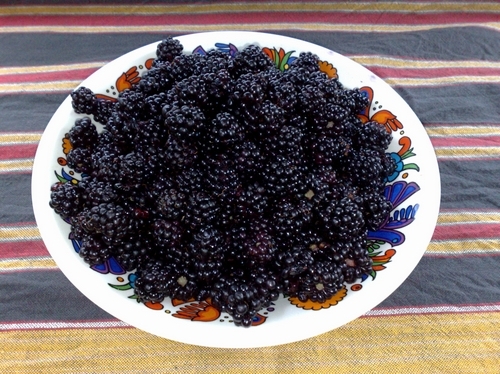 Blackberry salad with lovage (from the garden)? Blackberry cake? I thought this was going to be about the devices. Ha! Well, I’m glad you didn’t use the remaining berries to color a mobile phone skin or something! Blackberry sorbet is just mmmmmmmmmmmmmmmmm!!!!! 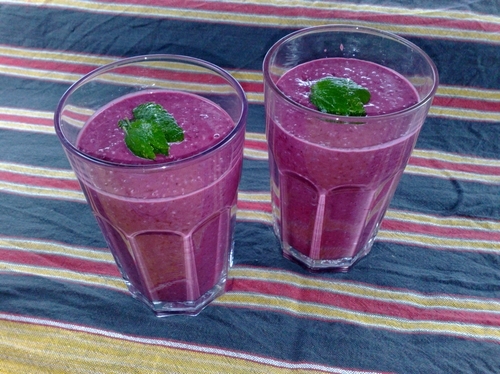 The purple milk shake doesnt look too bad until u added the green ……..what might that be again?ever tried a black berry cake or ugali????? Green leaves = fresh lemon balm.